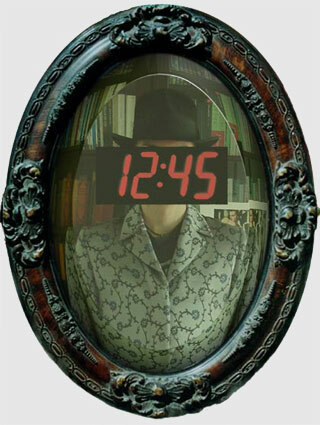 the post-neo-classical-surrealist mirror/clock. A surrealist image that will never go out of fashion as the fashion one sees in it is constantly changing. vaguely based on Rene Magritte’s surrealist imagery, the surrealist mirror is a framed mirror, with an LED clock/matrix pannel inserted into its middle, thus obstructing the view of one’s self, rendering it ornamental, yet awkward to use to mirror one’s self.